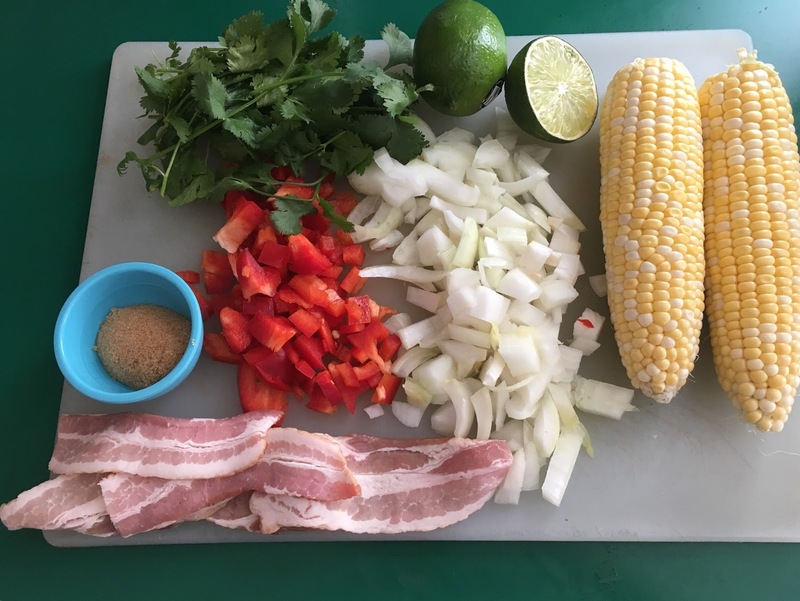 HALLIE EPHRON: Recently I discovered a recipe on Epicurious for corn relish spiked with bacon, a perfect side dish now that fresh corn is back in the supermarket. 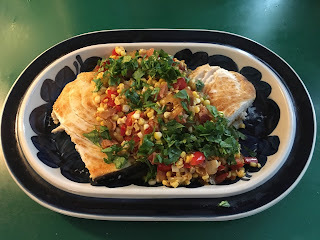 My version of the recipe is made with fresh corn cut from the cob (so much sweeter than frozen) and adds sweet red pepper and fresh cilantro. I've been serving it warm with pan-roasted or grilled fish. Or turn it into a main dish on its own by adding lots of crumbled feta cheese. 1. Cook the bacon strips until crispy; remove, drain, and chop into pieces. SAVE THE FAT.2. In the bacon fat sautee the onion 4 minutes over low/medium heat. Add red pepper. Continue to sautee 3 MORE minutes. 3. 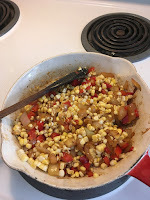 Add corn, brown sugar, ¼ tsp salt, and cook for 2-3 minutes, stirring. Turn off the heat. 4. Add lime juice, bacon. Salt and pepper to taste. Mix. 5. Serve warm, topped with cilantro. What are you eating now that 'it's' in the market? Thanks so much for the recipe . . . this sounds delicious. I can’t wait to try it! Sounds delicious! I'll try anything with bacon and brown sugar in it! Local lettuce and eggs are back, and I have asparagus in my garden! I'm so excited about the start of the local produce season. Edith, the chive plant you gave me last year is thriving. Thanks again! Wait 'til the rabbits find it! Asparagus. Waiting for fresh Michigan blueberries for muffins and pies. Fresh parsley, rosemary, and tarragon from my garden. We have asparagus and fresh lettuce in my garden, along with chives, mint, lemon balm, oregano, and some other herbs. And I just bought eggs and a free-range chicken yesterday, hoping to get some morels at the market this morning. I'm waiting for my favorite, the scapes from the garlic I won't harvest until the end of June. The scapes have to be cut off, since otherwise they flower and make seeds instead of building the bulbs nice and fat. The bonus is they are the perfect spring vegetable, tasting of a fresher and greener version of garlic. It can be used the same as green onions. We eat it raw, chopped into salads, or cooked into omelets or anything, really. If you don't have your own hardscape garlic patch, many vendors at the farmers market have them, often for ten cents apiece. Last summer, I bought 11 dozen ears of fresh corn at a local farm, picked less than an hour before. We processed them as you did above, Hallie, and I froze them for use all winter. It's as sweet as any fresh corn, and has been a big hit at our house. We will definitely do this again, although maybe fewer ears. Love scapes! Here I snip them off around the summer solstice, I think. We're getting asparagus and having it almost every meal, but no local corn yet, not until July or so. I make a corn salad a little like Hallie's, but nothing is cooked, just corn, peppers, tomatoes, onions and fava beans with a little olive oil and balsamic vinegar. It's very "cleansing." The chives are a foot high and the thyme is greening up. Parsley and tarragon and rosemary are peaking thru, testing our spring weather. The mint is flourishing, a main ingredient of our infused water. The wisteria is competing with the lilac to see which fragrance is the more pervasive, abd the dogwoods are in all their glory. The spring bulbs are over and the iris hasn't bloomed yet, but the violas are everywhere, reseeding themselves from years past. I've spent the weekend enjoying the royal wedding, thinking what Meghan brought to the table, the breaking of the all white tradition in the palaces of Britain and thinking of Victoria and Abdul. Interesting what a difference a couple of generations can make. Yes Mine must be ten years old. I have it in full sun in a rock garden. Herbs are like weeds. They don’t care about being watered or fertilized. They just grow! I bring a couple of handfuls of thyme in for winter use but cut it fresh during the rest of the year. Thyme is hardy here on the NH border, Hallie. Hallie! !That looks yummy. Corn, fresh corn on the cob it is one of my favorite things in the entire world. We sometimes steam it for a minute or two, then threw it on the grill, which is also so delicious! And if you would love a carbohydrate festival, take those ingredients you used as relish, and mix them into hot pasta. Yum Yum Yum. Hallie, you should have a food blog - my gosh - that looks deeeeelicious! This looks delicious! Thanks, Hallie! Dewberries! Picked a ton a few weeks ago. I’ve made a couple of cobblers so far. Looks good. I'll need to trade two ingredients, though. Cherry tomatoes for the red peppers (I like them, but they do not like me). At first I didn't think I cared for the sound of this dish, Hallie, but then I started reading further about the ingredients, and I am looking forward to fixing it. Yum! Things have been crazy this month for me, but I'm hoping to start getting to the farmer's market on Saturdays. I can't wait for fresh local corn and blueberries later. Years ago I used to cut the corn off the cobs and and freeze it in bags for winter use. With hubby retiring (part-time), I may get him to help me start doing that again. No corn better than fresh. Of course, I can never get enough of fresh tomatoes in the summer, and if hubby and I start a garden, tomatoes and asparagus (another favorite) will definitely be two things we plant. I just hate the wait on the asparagus. My daughter has had her asparagus out for some years now, and so she has plenty for her family every year. I might have to beg some excess from her. Rhubarb! Finally saw some in the supermarket and grabbed and froze it. Made a crisp this week then I expected my sister for a few days. We almost ate the whole pan in one sitting. It was that good.